Automobile defects Category Archives — Illinois Personal Injury Lawyer Blog Published by Illinois Personal Injury Attorneys — The Collins Law Firm, P.C. Heard about the exploding Takata air bags installed in many cars? 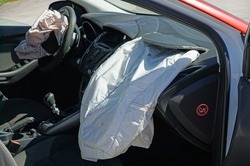 Upon impact, these airbags explode with such force that they propel metallic shrapnel into the car, and, tragically in some instances, into the car’s driver or passenger. So far, worldwide, 16 people have died and 180 more have been injured. This, of course, led to multiple lawsuits against car manufacturers and others, seeking compensation for victims, and to provide for the removal of millions of Takata air bags and installation of safe bags. Today, four car manufacturers–Toyota, Subaru, Mazda, and BMW–agreed to pay a total of $553 to settle the lawsuits that had been filed against them. $553 MILLION. It’s an enormous amount of money, of course. Could Your Car’s Takata Airbag Kill You? January 24, 2017 | The Collins Law Firm, P.C. Could the airbag in the automobile you drive, that is supposed to protect you in the event of an accident, seriously harm or even kill you instead? For millions of drivers in the U.S., the unfortunate answer is yes. And many of these people are still unaware of the danger. Co-authored by Cassidy Carroll of The Collins Law Firm, P.C. Recently, a Texas jury ordered Audi to pay $124.5 million to an 11-year-old boy who was left brain damaged, partially paralyzed and blinded in his right eye in a 2012 rear-end collision. The verdict is in response to Audi equipping their 2005 Audi A4 with a seat back that was too weak to withstand a rear-end crash. At the trial, the parents of the boy argued that, despite wearing seatbelts, the inadequate seat back caused the front seat collapse resulting in the driver, the boy’s father, sliding backwards and hitting his head on his son’s head in the back seat. The accident occurred when their car was rear-ended after they stopped for a school bus. Earlier this month, the Obama Administration announced a $70 million fine against automaker Honda. The fine–the largest civil penalty levied against an automaker–is in response to Honda’s failure to report to regulators death and injury complaints for over a decade between 2003 and 2014. Among those complaints that were not reported were incidents of airbag failures manufactured by Japanese auto supplier Takata Corp. Takata-made airbags can rupture after a crash creating potentially fatal injuries to drivers and passengers. This government action highlights the serious consequences to the American public of defectively manufactured automobiles. Each year, thousands of people are injured or killed as a result of unreasonably dangerous and defective cars, trucks and motorcycles. Government action, like that taken against Honda, along with civil lawsuits against the manufacturers of defective automobiles work together to expose defective products, compensate those who have been injured or killed by these defective products and serve to improve future products and protect the public.